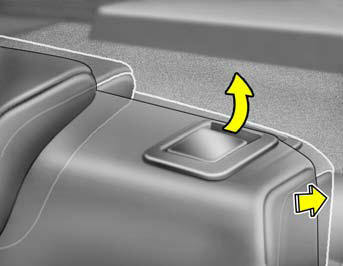 To recline the seatback, pull up the seatback folding lever (1) and push the seatback rearward. To return the seatback to an upright position, pull up the seatback folding lever (1) and pull the seatback forward until the seatback locks into upright position. After adjusting the seatback angle, always check that it is securely locked into place. Do not adjust the seatback angle while the vehicle is in motion.